Hardboiled detective fiction and puzzle games seem like they should go hand in hand. 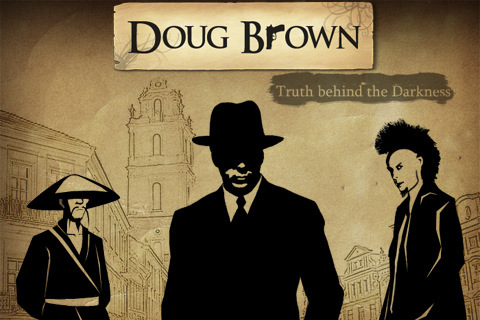 It’s been done successfully before, but when compared to the polished likes of Nick Chase: Detective Story, Doug Brown comes across as an awkward schizophrenic wannabe in the high stakes world of app noir. Naturally, you play as the title character, a predictably poker-faced private eye investigating a mystery. Unfortunately, you shouldn’t expect some intriguing story. There are brief story scenes, but they’re very minor and make little to no sense. Instead, you just get right down to puzzles and mini-games, which ordinarily I wouldn’t see as a problem, but the quality varies enormously. Some of the puzzles are perfectly fine, if somewhat random and unmotivated, but others fare less well, and a couple seem designed specifically as a form of app-based torture. For example, one mini-game involves a “car chase”, which is actually just you racing around in a circle for no apparent reason. Combine that with poor touch controls, and you have a surefire recipe for a lot of frustrated screaming. “Infuriating” is not a word I would use lightly, but some of the mini-games fit that description all too well. Puzzle games are usually among my very favorites, so it was troubling to find myself actively hating a game that on paper I should have loved. With Doug Brown, I did like some of the puzzles, and there were elements that I strongly enjoyed, like the minimalistic sepia and black art style, but as a whole, the game is a mess, and the generally uneven quality of the experience was just altogether disappointing. There’s just barely any story, and there’s no rhyme or reason to the mini-games, and they have so little charm to keep you engaged. Frequently you’re just bouncing featureless grey balls against a plain background. Now, I mentioned that I liked the minimalist art style, but can someone tell me what featureless grey balls have to do with a hardboiled detective story, because I really don’t have a clue as to why they were there. Overall, the game desperately lacks a coherent storyline and enjoyable puzzles. Although it wouldn’t have fixed all of the problems, a Skip Level would have made things mildly less awful, since you could then opt out of the more wretched mini-games, but as it is, what you’d hoped would be a fun, gritty, crime thriller turns out to be one randomly punishing challenge of dexterity after another. 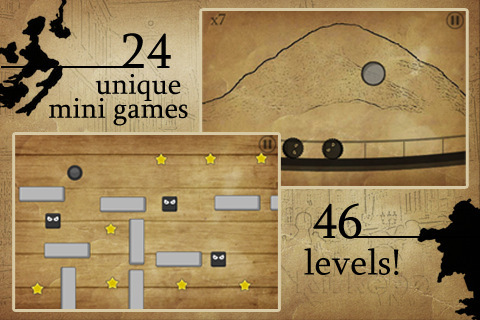 AppSafari review of Doug Brown was written by Tracy Yonemoto on November 18th, 2010 and categorized under Action, Adventure, App Store, Games, iPad apps, Mini Games, Puzzler. Page viewed 5028 times, 2 so far today. Need help on using these apps? Please read the Help Page.